Mrs. Sybil Moholy-Nagy, New York. R. Kostelanetz, Moholy-Nagy, Documentary Monographs in Art 1970, no. 5. Dresden, Galerie Fides, Moholy-Nagy, 1926. London, London Gallery Ltd, Moholy-Nagy, December-January 1937, no. 18 (illustrated p. 21 and incorrectly dated 1924). London, New London Gallery, Moholy-Nagy, May-June 1961, no. 22. Eindhoven, Stedelijk van Abbemuseum, 1967, no. A14. This exhibition later travelled to Denhaag, Gemeentemuseum and Wuppertal, Von der Heydt Museum. Chicago, Museum of Contemporary Art, Moholy-Nagy, May-July 1969, no. 15 (illustrated in colour p. 25). This exhibition later travelled to New York, The Solomon R. Guggenheim Museum. London, Institute of Contemporary Arts, L. Moholy-Nagy, January-February 1980, no. 8. This exhibition later travelled to Leicester, Leicester Museum and Art Gallery, February-March 1980; Edinburgh, Scottish National Gallery of Modern Art, March-April 1980 and Newcastle, Hatton Gallery, University of Newcastle-upon-Tyne, April-May 1980. London, Annely Juda Fine Art, The First Russian Show - A Commemoration, September-December 1983, no. 99 (illustrated p. 165). Valencia, IVAM Centre Julio González, Moholy-Nagy, February-April 1991, no. 24 (illustrated in colour p. 45). Marseilles, Musée Cantini, Moholy-Nagy, July-September 1991, no. 66 (illustrated in colour p. 110). Kassel, Museum Fridericianum, László Moholy-Nagy, 1991, no. 26 (illustrated). Berlin, Kunsthandel Wolgang Wernerkg, László Moholy-Nagy, February-April 1995, no. 7 (illustrated in colour). Brussels, Fondation Europalia International, Avant-Garde Hongroise 1915-1925, October 1999-January 2000, no. 104 (illustrated in colour p. 168). "My belief is that mathematically harmonious shapes, executed precisely, are filled with emotional quality, and that they represent the perfect balance between feeling and intellect." (Abstract of an Artist). One of the finest artistic achievements of its time, A XI is a masterpiece of geometric abstraction that represents both the culmination of Moholy-Nagy's painting, and the genesis of his radical experiments with light as an active medium in a work of art. 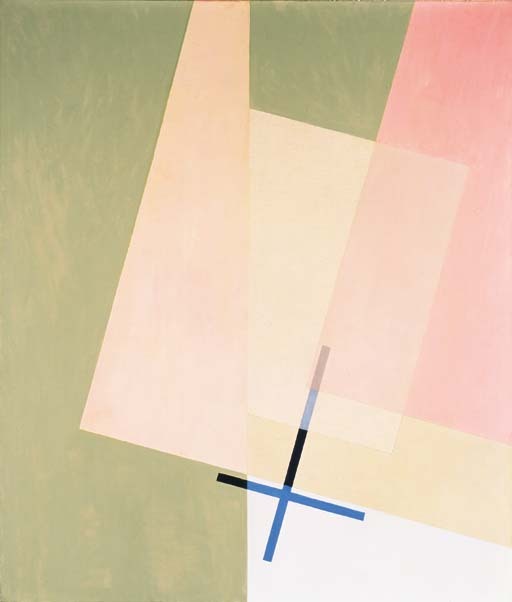 Painted in the year that Moholy-Nagy first joined the Bauhaus as its youngest professor, the present work is a painterly construction of geometric form that has been precisely engineered into a harmonious unit of form, colour and illusory space. With its gentle gradations of colour suggesting a degree of transparency in the painting's coloured planes, A XI also incorporates the suggestion of light and three-dimensional space into the structure of the composition. "My transparent pictures around 1921 became completely freed from all elements reminiscent of nature", Moholy-Nagy recalled. "Their genesis was determined by a complete liberation from a necessity to record. I wanted to eliminate all factors, which might disturb their clarity - in contrast for instance with Kandinsky's paintings, which reminded me of an undersea world. My desire was to work with nothing but the peculiar characteristics of colours, with their pure relationships. I chose simple geometric forms as a step toward such objectivity. I see today this was the logical continuation of the Cubist paintings I had admiringly studied." (Moholy-Nagy writing in, ed. R. Motherwell, Abstract of an Artist, László Moholy-Nagy, Documents of Modern Art, New York 1947). Proceeding from the aim of using colour as an independent and constructive element in its own right, Moholy-Nagy found that the suggestion of their transparency could further establish the independence of each form and also articulate the sense of space between them. Transparency, or the suggestion of it through colour, became a revelation for the artist as not only did it distinguish his work from that of other major abstract masters like Mondrian, Malevich, Kandinsky and El Lissitzky, marking a significant progression from their work, but it also introduced the new concept of the relationship between light and space into the constructive process of building a composition. "I discovered that composition is directed by an unconscious sense of order in regard to the relations of colour, shape, position, and often by a geometrical correspondence of elements." Moholy-Nagy wrote, "I eliminated the perspective employed in my former paintings. I simplified everything to geometrical shapes, flat unbroken colours;....Colour which so far I had considered mainly for its illustrative possibilities, was transformed into a force loaded with potential space articulation, and full of emotional qualities." (ibid.). In this way, the introduction of transparency into abstract painting created an entirely different sense of space from the implicit mysticism of Malevich's Suprematism where geometric shapes seemed to float and interact solely against an infinite white background. It introduced a sense of 'real' space that, for Moholy-Nagy opened up the possibility of translating the constructive process of picture making into the three dimensional world where his building materials would be not only colour and form but could also expand to include light, sound and motion. In this way, the constructive process that Moholy-Nagy originated in these early paintings formed the genesis of his later experiments with totality at the Bauhaus. For the artist, the Constructive process that was "directed by an unconscious sense of order" was rooted in nature. "Constructivism," he maintained, is "neither proletarian nor capitalistic. Constructivism is primordial, without class or ancestor. It expresses the pure form of nature - the direct colour, the spatial rhythm, the equilibrium of form.....It is the socialism of vision." ('Constructivism and the Proletariat', MA, May 1922; cited in, S. Moholy-Nagy, Moholy-Nagy: Experiment in Totality, New York 1950, p. 19). Because of his belief in the Constructive process to unleash the inherent beauty from any material or form, Moholy-Nagy was not only able to translate his artistic vision into all and any media, but he also experienced none of the anxieties about embracing modern technology that concerned many of his colleagues. On the contrary, Moholy-Nagy believed that, "The reality of our century is technology; the invention, construction and maintenance of machines" was essential and was acting "in the spirit of our century'. A XI is one of the finest expressions of Moholy-Nagy's creative aims. Consisting purely of flat geometric coloured shapes this sublime painting miraculously seems to convey a sense of calm, harmony and counterbalance through a subtle mastery of light, colour and space. Seemingly layered over one another in an ambiguous cascade, the coloured planes of the painting interact with each other in both a formal and spatial harmony that is anchored into a unity by the blue cross at the lower centre of the canvas. Unlike the paintings of Malevich or indeed Kandinsky, the forms of A XI do not seem to float above or within a mystical and infinite expanse of space but are themselves defined and positioned by the proportions of the painting itself. The edges of the painting are therefore as important a part of the overall composition as the coloured planes within them. A complete articulation of form, the remarkable sense of harmony and unity that is asserted by the simple forms and colours of this exquisite work make it one of the most powerful expressions of the utopian beauty of Moholy-Nagy's vision and an important testament to his unique genius.